elcome to Lyn Mann's corner of the Internet. Lyn is a well known Southern California professional quilt designer, teacher and lecturer. We hope you enjoy your visit and hope you return often because the site is still developing and many additions are planned. Lyn has been quilting since the early 80's and her interest went from hobby to passion and progressed to full time profession when she discovered she really enjoyed teaching. 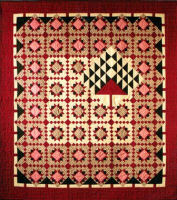 Over the years her quilts have been featured in numerous books and magazines. For more of Lyn's background be sure and visit About Lyn. Lyn had designed over 70 new quilts that she has taught as a mystery. She also teaches Mystery by Email and charges a nominal fee for taking the class. These are done twice a year and if you are interested, contact Lyn to be put on her mystery list. On this site you will find Lyn's patterns which may be purchased thru her company Penache. Check the Patterns section for viewing and ordering her patterns. Be sure to check out the Testimonial page to see what some of her students, shop owners and retreat organizers have to say about her classes and teaching techniques. If you are interested in attending one of Lyn's classes, be sure and view the Classes schedules and locations for local classes. She is willing to travel almost anywhere to share her ideas and techniques and if you are in charge of guild programs or retreats and would like Lyn visit, view the Lectures & Workshops page and contact Lyn for fee information and scheduling. Some services provided by "The Old Drawin' Board"